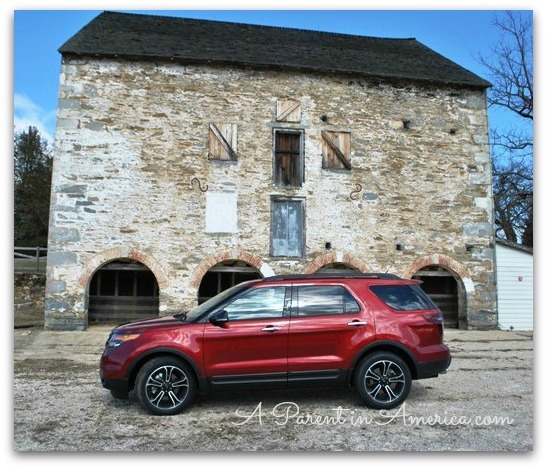 I had the chance to test drive the 2013 Ford Explorer Sport — the brand new souped-up, blinged out version of this favorite SUV. And now I want to buy it. Really. What differentiates the Explorer Sport from the standard Explorer is the 3.5-liter EcoBoost V-6 engine. When I drove it I could feel the impressive horsepower and super-fast acceleration. Its sport suspension and tight handling reminded me of when I have driven a BMW X-5. Open roads when using the six speed SelectShift Paddle Shifters on the steering columns, which allow for the that stick-shift feel, made for a seriously beautiful drive. The EcoBoost engine also means that although this is a seven-seater, it will receive an EPA-estimated 20 MPG (17 city, 24 highway), which is much more fuel-efficient that other SUVs this size. Although I drove to both Gaithersburg and Baltimore round-trip from our house in Silver Spring, in addition to my usual Montgomery County soccer mom circuit, I did not have to visit the pump all week. The four wheel drive was the best I have tested. Ford’s Terrain Management System makes transferring from the drive settings easy, even mid-drive. There is normal (front wheel drive for every day), mud/ruts (allows tires to spin as needed), sand (all-wheel drive) and grass/gravel/s now (minimizes wheelslip). A new feature for 2013 is Hill Descent Control for safe maneuvering of off-road downhills. A special button signals the Explorer to maintain a steady speed down the hill, and the driver simply steers. If you have a trailer, boat or other item you would like to tow, the Explorer Sport is also celebrated for its towing capabilities (which I did not test). 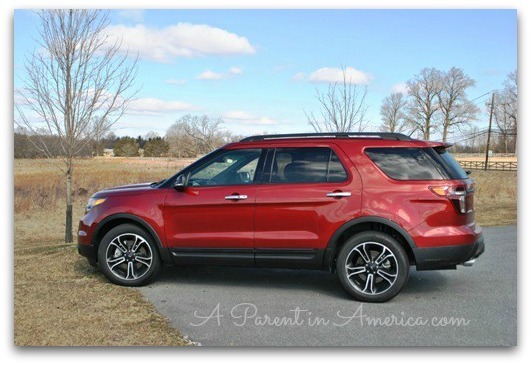 The entire family loved the Explorer Sport’s Remote Start/Automatic Climate Control System. With just a click on the keyless start fob, the cabin temperature was pre-heated to 72 degrees, the heated seats were set to high and the rear defrost/heated mirrors were activated before anyone climbed in. This took “warming up the car” to a whole new leverl! In hot weather conditions, the cabin can be cooled to 72 degrees and the cooled seats set to high before you enter! As I wrote about in my review of the Ford Escape, I love using SNYC with MyFord Touch to sync my iPhone with the Explorer Sport’s system, and soon my contacts, playlists and addresses were easily accessible on the LCD center touch screen. I used both voice commands and touch to call friends, find locations on the navigation and change radio channels. I also could charge my phone while driving using the USB port. The Sony audio system’s HD speakers were crystal clear for both local and satellite radio, and I loved the ease of navigating channels from the steering column. And as a mother of three, the Blind Spot Information System (BLIS) gets my vote for safest invention. A little light comes on the side mirrors if another vehicle is in your blind spot! My second vote goes to the ingenious “back-up camera” (aka the Forward and Reverse Sensing Systems). This car is seriously beautiful, inside and out. The big 20-inch machined aluminum wheels have painted pockets, the leather-trimmed bucket seats are living room-worthy, the front grille on the Sport has an exclusive Explorer badge that is not featured on the other trims. It comes in White Platinum, Ruby Red, Ingot Silver and Tuxedo Black. It is really, really pretty. I used to think that with having at least three children (hey, who knows what the next years may bring! ), my only car option was a minivan or a massive Suburban-sized SUV. But the Ford Explorer Sport felt just as roomy as my trusty old Honda Odyssey. I was able to load just as many groceries, strollers and children as I needed. And I felt pretty sporty and luxurious while doing it. 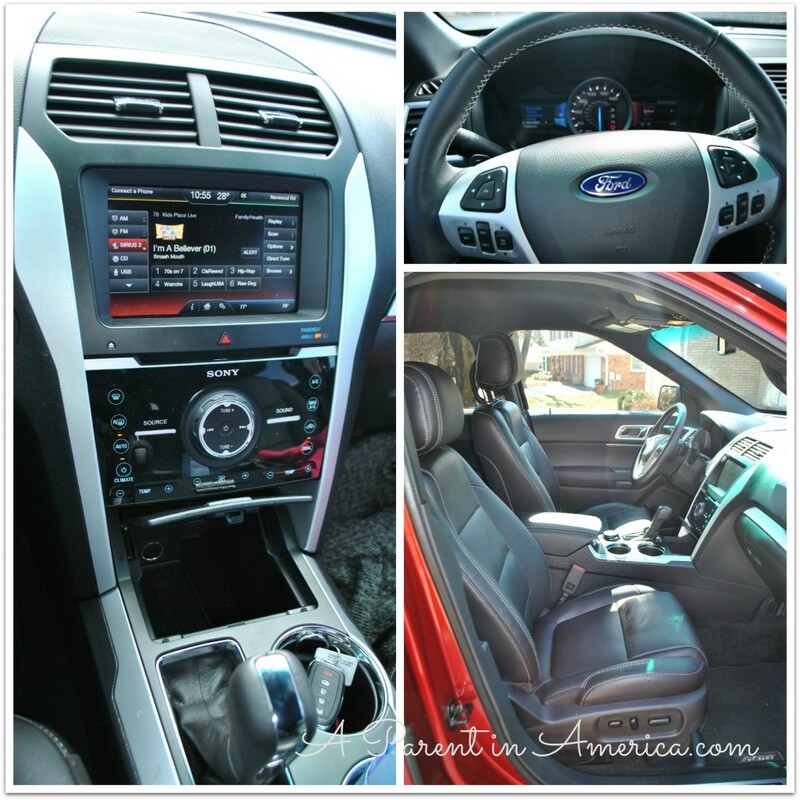 The 2013 Ford Explorer Sport was a dream of an SUV, combining luxury and family features. It is now at the top of my list for my next car purchase. 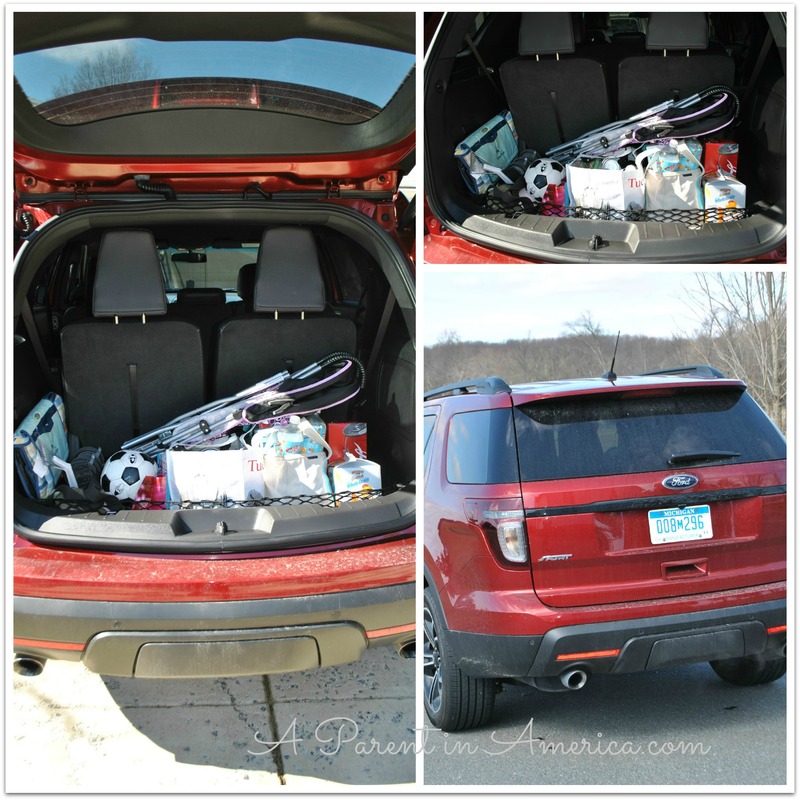 I received a 2013 Ford Explorer Sport to test-drive for seven days and a full tank of gas. No other compensation was received. It was a pleasure to review.